Confession before I speak furthermore. Curiosity kicked in and began my quest in searching for biryani recipes, though I think you know it as well? I am not left far behind when biryani is a concern or even the much more easy to put together or maybe requiring extra ingredients and time rice dishes (Hyderabadi Biryani & Vegetable Biryani)? Pretty much says it all (Rice Pilaf). Nevertheless, checking through a couple of the Burmese Biryani recipes and mostly popping up Burmese Chicken Biryani, oh-boy glad I was. Burmese Biryani Biryani and more or less due to my Indian heritage (Fish Puttu, Indian Spiced Salmon & Ghee Rice) and possibly Chinese (Teochew Steamed Fish) and Thai influences (Thai Crispy Fish) too? Yet I had to opt for fish because, like I have already told you before, my other half-half and his taboo towards chicken (Indonesian Grilled Fish & Mauritian Fish Curry). Having said that, I must confidently say this my version must trended so close behind any authentic and traditional Burmese Biryani. Attractive bright yellow hue (Turmeric Rice & Lemon Cashew Rice) from saffron strands, spices and all things nice from the aroma and richness of ghee, and coriander leaves (Coriander Rice) scented, cooked in the rice cooker (Curry Leaves Rice & Dhal Rice) biryani. Teamed alongside masala pan fried salmon, raw vegetable yogurt salad (Vegetable Raita) and boiled egg(s). Wholesome, filling and fab Burmese Biryani. Marinated fish with all the ingredients listed above except oil. Set aside, if you can, for half an hour. Thereafter, heat a non-stick pan and drizzle oil inside. Fry and cook on both sides. Fry cashew nuts till crispy and brown. Do the same for shallots - fry till crispy and remove. Now add spices and quickly fry. Put in rice and stir for a few minutes. Add salt, saffron strands and water. Gently stir and let it cook. Once cooked, fluff up rice. 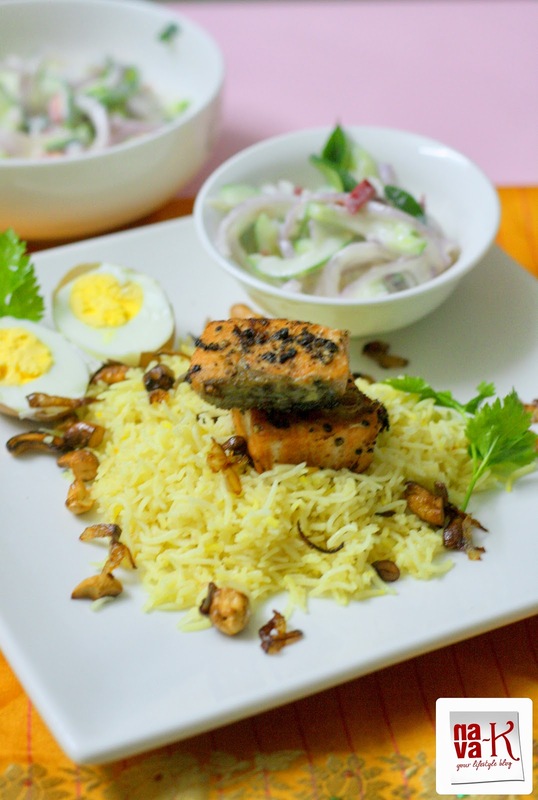 To serve - garnish biryani fried shallots, fried cashews and coriander leaves. Place fish atop and paired along vegetable raita and boiled egg(s). I understand your feeling. Indeed, i too worried about MH370 passages. I think, i need to add some more spicy to Salmon Pulao Rice in order to meet our family needs. Thanks for the recipe. Wow!! I'm drooling over the pic.. Looks Mouthwatering dear..
Pulao looks amazing .Very colorful nd very tempting . Even in my house almost everyday we talk about the unfortunate incidence.. I don't understand that with all these powerful satellites why on earth no one can find a big plane? Lovely one pot meal. Looks delicious Nava. We are all hoping for a good outcome for MH370. Such a tasty and healthy rice dish...yum! 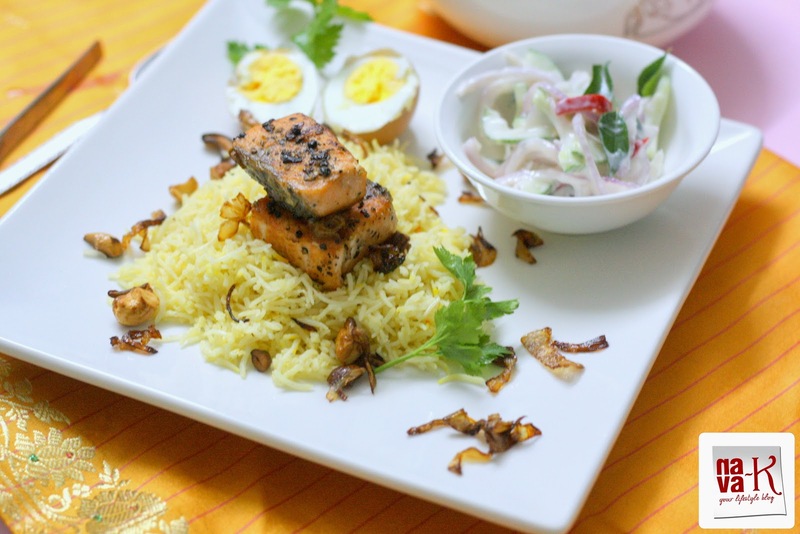 Salmon pulao looks extremely inviting .. When everything around us is so disturbing feel like food comes as a solace for some worries atleast. Just praying and hoping for the best! The rice looks delicious Nava :-) I grill or fry the fish for my daughter with the same ingredients you have used.. I think I will do the rice aswell next time for her. oh my, this looks so lovely..wish salmon was not overtly expensive here. Looks so yummy. Everytime , I see your seafood posts, my mind starts boggling me .why did i stop eating fish. It is indeed painful and i can't even imagine the pain of the families of the people on board.. The simple but flavorful food looks great and inviting.. Very appetising clicks Nav. Your post has made me hungry. Salmon fried in ghee! How come I never thought of that. We eat salmon several times a week and my favourite recipes are Asian. This is a fabulous meal, simple yet gorgeous. I am going to try this soon. Salmon has looks so yum, you are great so many recipies. With the cinnamon, cloves and anise, that rice must have been so so fragrant! This sounds like such a delicious dish! The disappearance of MH370 is on my mind too - my heart goes out to all the passengers. All our thoughts and prayers are just about the missing plane. Keeping fingers crossed for some good news. Salmon in pulao...that's a new combination. A very healthy fish that has to be included in our diet. The pulao is good n innovative. 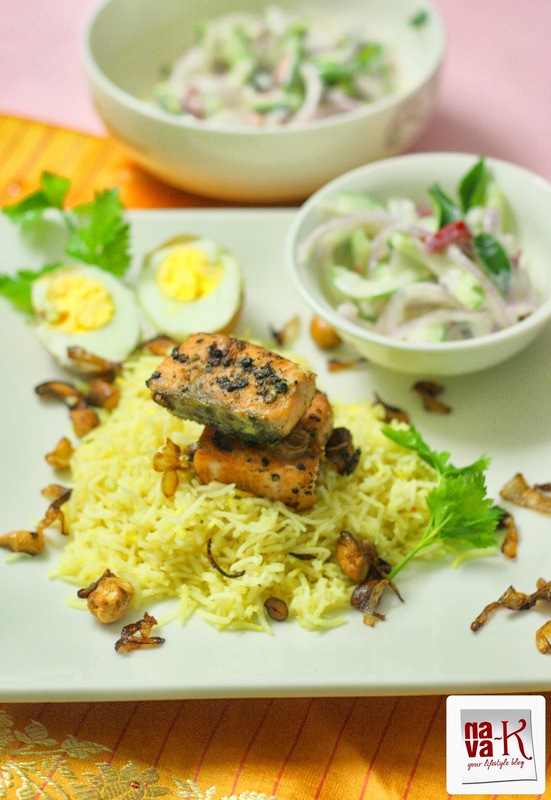 Such a lovely pulao, you know I love salmon and this looks so good with vegetable raita. that's a very interesting recipe ! wonderful combo ! looks lovely...I understand how u feel Nava ! when I think about the relatives of the people on the plane ,I really feel bad...I pray that they soon find it ..
Salmon pulao looks and sounds so yummy! Hoping for some positive news for the missing plane! Salmon is one of my favorite fish. I'm always looking for ways to make it so this is perfect to try.